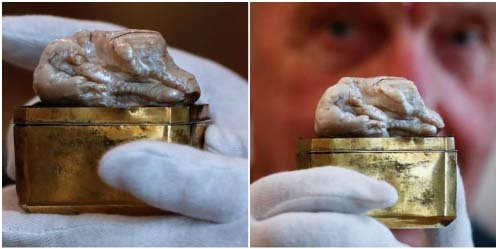 The world’s largest freshwater pearl, known as the ‘Sleeping Lion’, sold at an auction in the Netherlands Thursday for $374,000. However the pearl, which is 7cm (2.75in) long and weighs more than 153g (5.4oz) and was once owned by Catherine the Great, did not reach its estimate. The Venduehuis auction house in The Hague said this was the first auction of the pearl in 240 years. The Sleeping Lion is thought to have formed in China between 1700 and 1760, before making its way to Europe. The auction house says it weighs 2,373 grains - an imperial unit of measurement based on grains of barley and wheat.